Are You Worried About Getting Laid Off Your HR Job? Could The Next Round of Cutbacks Include YOU? Thousands of HR folks have lost their jobs in the last year. With all the distressing news about the economy, it’s hard to avoid feeling that your Human Resources job could be next to get the ax. Even though you’re in HR, if you’re slated to get downsized or fired from your HR job, chances are you won’t know about it until happens. And that’s a very uncomfortable feeling. Unfortunately, it’s just a fact of life in most organizations. One, you can let the market and the media send you into panic mode. 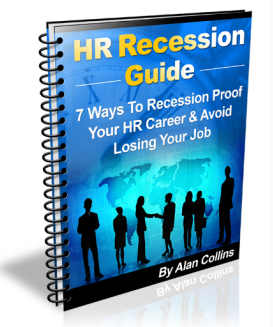 Or two, you can arm yourself with proven strategies for surviving the recession and enhance your HR career by making it recession-proof. Obviously, this is the option you should select. I’m Alan Collins. 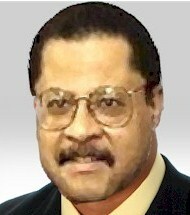 I provide online career advice and coaching for up and coming HR executives and professionals. Formerly, I was Vice President – Human Resources at Pepsi, where I led human resources initiatives for their Quaker Oats, Gatorade & Tropicana businesses. What even the most talented Human Resources professionals are NOT doing which is putting their job and their career at risk. Which HR career strategies used to work in the 1990s and early 2000s, but are now obsolete and simply not effective in this recession. How just being busy doing your HR job can be a fatal career mistake and make your job even more vulnerable to being eliminated. Extra Bonus! What you should do right now if you are absolutely convinced that you are about to be let go, and it’s too late and there’s nothing you can do about it. Here are the action steps you should take immediately before the ax falls! This confidential guide is valued at $19.95. But it’s available to you now for a limited time for FREE. I’m doing this to make sure it gets into as many HR hands as possible. Don’t be a helpless victim! Stop laying awake at night playing “what if” games. This inspiring guide will arm you with the best strategies that can help you keep your Human Resources job while continuing to build the kind of HR career you want and deserve–without the paralyzing fear of the recession. Act now!